For some of us, cold weather is regarded as a mere nuisance; for others, it’s a fun time filled with snowboarding, skiing and other winter joys; and still others will find this time of bone-chilling weather and huge piles of snow a veritable nightmare to endure. Whatever your viewpoint on winter, one thing remains the same for all of us with pets: it’s a time when our beloved babies need a little extra care. Tips: Do Dogs Need Sweaters in Winter? 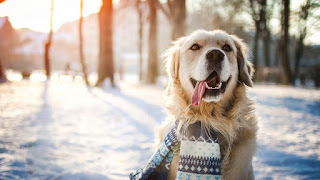 If your dog feels the cold, try to walk him in the late morning or early afternoon hours when temperatures are a little warmer, and avoid early morning or late evening walks. Spend time playing outdoors while it’s sunny; sunshine brings the added benefit of providing both you and your pet with vitamin D. Play fetch with toys, not sticks, which can cause choking and other injuries. So, if your dog likes to chew and chase, pack a Frisbee, ball or other safe toy and play together in the sun. Because it takes more energy to stay warm when it's cold, outdoor animals eat more during the winter. Likewise, fresh, running water is vital for maintaining your pet's health. Keep an eye on the water bowls and make sure they haven’t turned into little skating rinks for fleas . While ice pops might be a fun treat, your pet really doesn’t want to have to lick a frozen lump of ice to get his water. 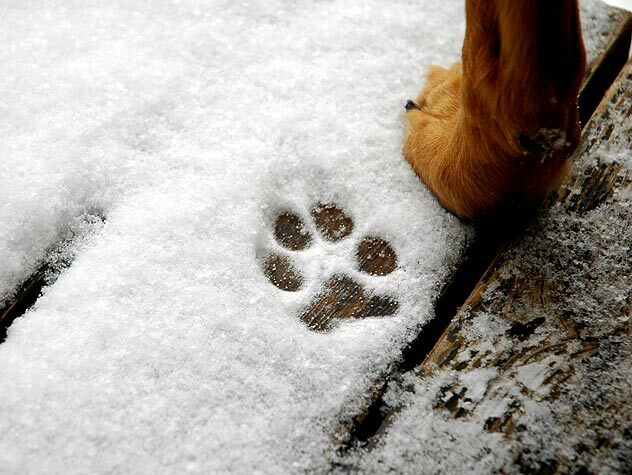 In addition to limiting your dog’s time outdoors on cold days, don’t let your pooch sleep on a cold floor in winter. Choosing the right bedding is vital to ensure your dog stays warm. Warm blankets can create a snug environment; raised beds can keep your dog off cold tiles or concrete, and heated pet beds can help keep the stiffness out of aging joints. Place your dog’s bed in a warm spot away from drafts, cold tile or uncarpeted floors, preferably in a favorite spot where he sleeps every day so that the area doesn’t feel unfamiliar. 5. Learn how to walk safely in winter weather. Dry and cold weather can do a number on your pet’s skin. Help prevent dry, flaky skin by adding a skin and coat supplement to his food. Coconut and fish oils are easy foods that can help keep your pet’s skin and coat healthy. If you find your pet’s paws, ears or tail are dry or cracking, you can also apply coconut oil topically as needed. 10. Dogs also should be kept inside if possible. If kept outside, they should have a draft-free shelter large enough to stand and turn around in, yet small enough to retain body heat. Use a layer of straw or other bedding material to help insulate your pet against the cold. Different breeds of dogs have different sheltering needs. Purchase a commercially produced doghouse, or contact your local humane society for construction plans for a doghouse suitable for your climate. Please be sure to contact your veterinarian if you have questions. 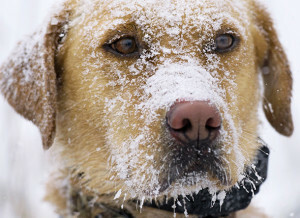 Snow can be a lot of fun but also dangerous for your dog. Snow piled near fences offers your dog escape routes that even well trained dogs often can’t resist. 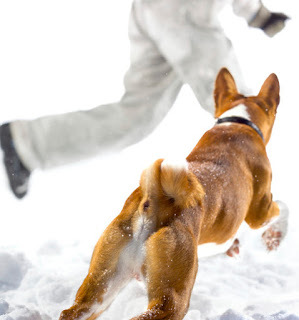 When you clear snow in your yard, pile it away from fences to prevent your dog from climbing over. Snow and ice often accumulate on rooftops and if the sun is out or as temperatures rise, this accumulation can slide and injure your dog. If you can’t clear the snow from the roof, keep your dog away from the roof overhang to prevent injury. Do you live in an area with cold and icy winters? Then you are probably accustomed to salt on the sidewalks and roads. However, the types of salt used to melt ice and snow and keep it from refreezing are somewhat harsh on delicate paws - not to mention they corrode concrete and damage the beautiful vegetation. Protect your pet's paws, and keep him warm during walks, by outfitting him with booties. Although your dog is likely to be having a great time outdoors, take frequent indoor breaks for water and warming and don’t ever stay out too long. If you’re walking or playing in unfamiliar areas, keep your dog close. 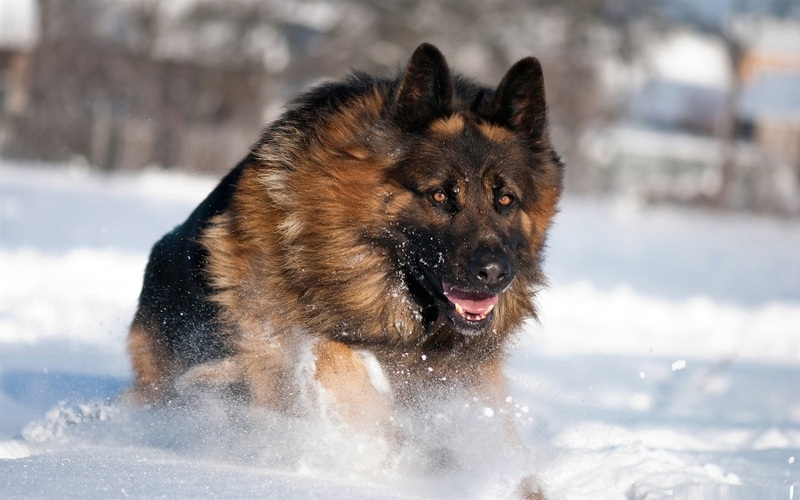 It’s easy for him to venture onto unsafe surfaces such as frozen ponds or lakes. These may be covered in snow and not easily visible.